Saving the Famine Irish: The Grey Nuns and the Great Hunger Exhibition opens April 1. March 11, 2015 – Ireland’s Great Hunger Institute at Quinnipiac University will open a new exhibition, “Saving the Famine Irish: The Grey Nuns and the Great Hunger,” on Wednesday, April 1 in the Arnold Bernhard Library on the Mount Carmel Campus, 275 Mount Carmel Ave. The exhibition tells the story of the religious orders in Montreal whose members gave selflessly to Irish immigrants during the summer of 1847 – their time of greatest need. 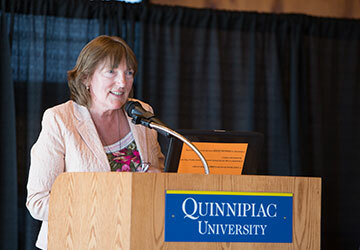 Christine Kinealy, founding director of Ireland’s Great Hunger Institute at Quinnipiac and a professor of history, is presenting the exhibition in collaboration with Jason King, Irish Research Council postdoctoral fellow at Moore Institute at Galway University, and the Arnold Bernhard Library. Many thousands of people fled from Ireland during the Great Hunger and immigrated to Canada. Famine immigrants to Montreal were not only among the poorest of the poor, but many of them arrived already sick with typhus fever. Despite this, a number of people in the English and French Canadian communities provided the ailing and the dying with shelter and support. 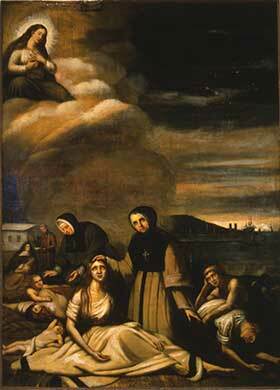 In the forefront of this compassionate movement were the Sisters of Charity, also known as the Grey Nuns. The year-long exhibition will be housed in the Lender Special Collection Room in the University’s library and will be open to the public from April 1, 2015 to March 18, 2016. Hours are Monday through Saturday, 9 a.m. to 5 p.m., and Sunday, noon to 5 p.m. The exhibition will be officially launched at a private event on Tuesday, March 31, by the Canadian Consul General (New York); Quebec Delegate to New England (Boston); and the Irish Consul General (NYC). For more information, call (203) 582-2634.